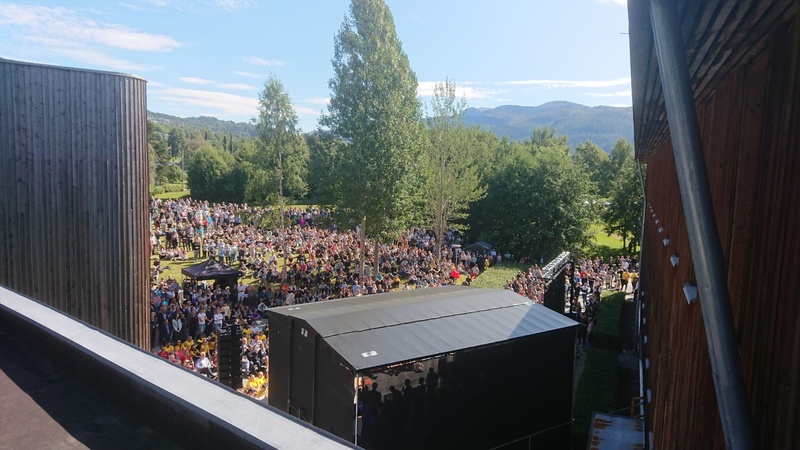 To those of you who are new as students, or new in Volda, I wish to say welcome to Volda University College. Here you will find open doors and many opportunities. Grab these opportunities. Meet new people. Create your future together with us and in the company of your fellow students, teachers and everyone else connected to VUC. I am happy that so many of the towns and municipalities surrounding Volda are represented here today. VUC aims to be an institution that serves the region – and for the entire region to feel that VUC is their university. Graduates from VUC will both now and in the future be attractive for the regional labour market. For some of you, it is perhaps necessary to be reminded that the region of Sunnmøre and Nordfjord boast world famous tourist destinations such as the UNESCO world heritage site Geirangerfjord, beautiful beaches, glaciers, the Art Deco city of Ålesund, the Sunnmøre Alps and Hjørundfjorden. International students, international staff and guest lecturers, and our many international student festivals, add an extra dimension to our college and our community as a whole. It makes Volda that much more interesting and colourful. We are very happy that so many new international students have chosen to study here with us. «No title». By Per Inge Bjørlo. Foto: Jaro Hollan. On the screen you can see the sculpture “No title” by Per Inge Bjørlo. It is located on the other side of the Berte Kanutte building behind me. The sculpture seemingly floats in the air. Let us for now suppose that it symbolizes a water molecule. In Volda, and along the Norwegian West-coast in general, rain is natural and expected. However, rain and fog has not been seen as something positive, and definitely not been used in marketing for tourists or new students. Yet, after this dry and warm summer, with many forest fires and water shortages, the cooling wet rain is now welcomed as a blessing from the skies. It surely felt like that when I walked home from the University College last week, and for the first time since April got wet in my hair and my face from soft rain. The sculpture from Bjørlo is made from welded, sandblasted and shiny stainless steel, maybe resembling an atom bomb. In a future where water is a scarce resource, both in terms of the production of electric power and household use, we may find ourselves in a world where water is used as a weapon – perhaps even more powerful and destructive than conventional weapons of steel. Millions may die from lack of water, maybe more than will ever die from nuclear bombs. What is the role of the university, its staff and students, in this kind of world? The natural sciences gives us the knowledge we need about water, the environment and climate change. We already have this knowledge and we have known it for quite some time. However, it seems as though we are still not capable of coming to terms with these facts or to make the right decisions. In this aspect, our institution, our study programmes and all students, can play a vital role. What do we say to the children – in the kindergarten and in schools? What message do we communicate through literature, arts and culture? What are the most important topics addressed in the media? How can we best govern and administer our societies? What can we learn from history? In general, which facts and what knowledge should we convey? How can we make sure that we learn, gain new insights and come to grips with the challenges facing our societies? These are questions that you students will be faced with during your studies and in your professional careers later on. These issues are also important for us as active citizens, as educated and knowledgeable human beings. People in power know that the young generations are influenced by the messages they hear from schools, arts and culture, mass media and rules and regulations. We see that in many countries, key public institutions are coming under attack and being diminished. Research, text books, broadcast media, arts and culture, all of these have been tried controlled by political leaders with anti-educational prejudices and brutish political objectives. Even the idea that such control is ok – the authoritarian rule – is gaining momentum and in some cases seem to have become normal. It is not necessary to travel to China or Iran to find such societies. Examples of such developments can be found just a short flight away from here: Russia, Turkey, Poland Hungary and maybe Italy. As an institution of higher education, we also try to do our part for a greener and more sustainable future. Last year we installed one of the largest solar-panel in the county of Møre & Romsdal on the roof of the Berte Kanutte-building behind me. Furthermore, VUC has recently been certified as an Eco-lighthouse, which means that environmental considerations will guide management at the college. We are also currently developing the Green Campus project in cooperation with the other universities in our region. I have been talking a lot about how you students will meet challenges in the future. But the first milestone coming up for you is to become students – to meet your professors and get to know new people. For this purpose, we have more than 100 buddies that will guide you through the next days and weeks. Buddies, make some noise so that we can see where you are! The leader of the Buddy Week will be on this stage shortly and the buddies will thereafter help you find your classroom and your professors – who are just as excited about the start the new school year as you are. First of all, keep your doors and hearts open for each other. Look after your fellow students and take responsibility. Ask others how they are doing – and actually care about the answer. Secondly, I urge you to take advantage of the surrounding nature, which must be some of the most beautiful scenery in the world. High peaks, fresh winds and clean water all around us – in the fjords, lakes and rivers. The towns and villages of Sunnmøre are located on a narrow strip of land between the wild and majestic Atlantic Ocean and rugged and dangerous mountain peaks. Take advantage of this nature. Go out in the woods, by the fjord and in the snow. But most of all, be smart and stay safe. Make precautions and take care of yourself and others. Enjoy Volda! Volda enjoys having you here. And in a short while you will experience that you have become an important part of our community. The best of luck with your studies here in Volda! 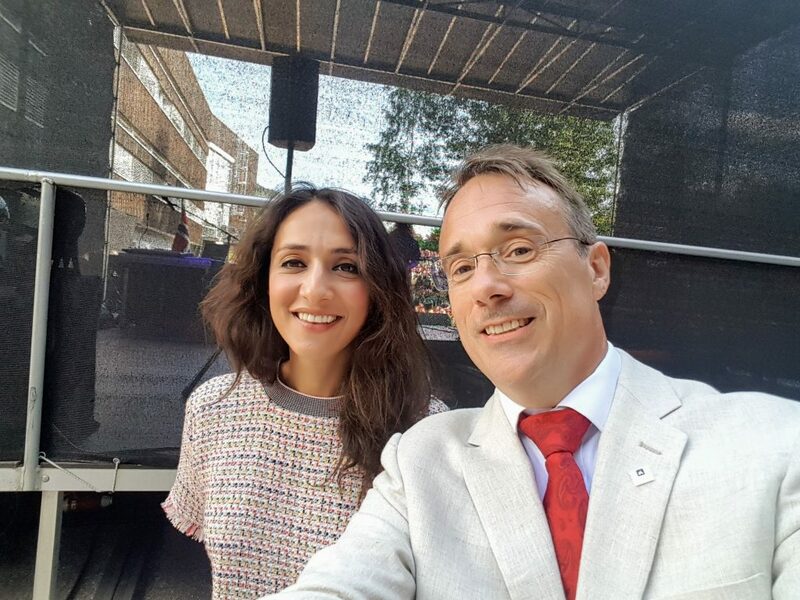 Speakers of 2018: Mah-Rukh Ali and rector Johann Roppen.